A novel series of 1,3-bis-(1,2,3-triazol-1-yl)-propan-2-ol derivatives was synthesized from 1-aryl-1,3-diazidopropan-2-ol derivatives and diverse alkynes using copper catalyzed azide-alkyne cycloaddition in the key step. Most of synthesized compounds showed high activity against Candida spp. 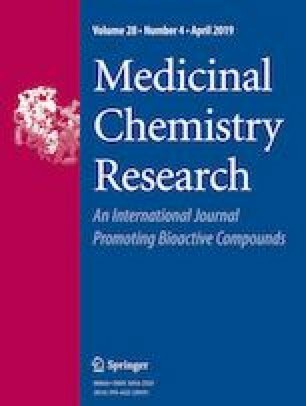 strains at a 0.04–0.5 μg/mL concentration range compared to Itraconazole and Fluconazole (MIC 2.56 and 1.28 μg/mL, respectively), which were used as reference compounds. A 1,3-bis-(1,2,3-triazol-1-yl)-propan-2-ol derivative (R1 = F and R2 = cyclopropyl) displayed an outstanding selectivity against Candida albicans and Candida krusei (MIC = 0.0075 µg/mL). Moreover, Artemia salina bioassay on 1,3-bis-(1,2,3-triazol-1-yl)-propan-2-ol derivatives revealed low toxicity in this kind of compounds. In addition, molecular docking studies suggest good binding affinity of halogen atoms in some 1-aryl-1,3-diazidopropan-2-ol derivatives to HEME group present in 14-alpha demethylase (CYP51), which might explain the high antifungal activity found in these compounds. The online version of this article ( https://doi.org/10.1007/s00044-019-02317-5) contains supplementary material, which is available to authorized users. This work was supported by COMECYT (fellowship for AZH) and ASCILA (fellowship for DDCC). Financial support from CONACYT is also gratefully acknowledged. The authors would like to thank Signa S.A. de C. V. for some kindly donated solvents and reagents and to N. Zavala, A. Nuñez, and L. Triana for the technical support.